Five months ago we introduced our urban lumber program to turn unwanted trees from local areas into slabs, saving them from the wood chipper. We’ve had great success in bringing in large amounts of logs in a variety of species, each more interesting than the last. Our Sarasota, FL mill started with just a small Wood-Mizer LT50 and has grown rapidly. We now house a Wood-Mizer 1000 capable of cutting logs up to 67” wide, and a vacuum kiln that dries slabs to the correct humidity for wood working. 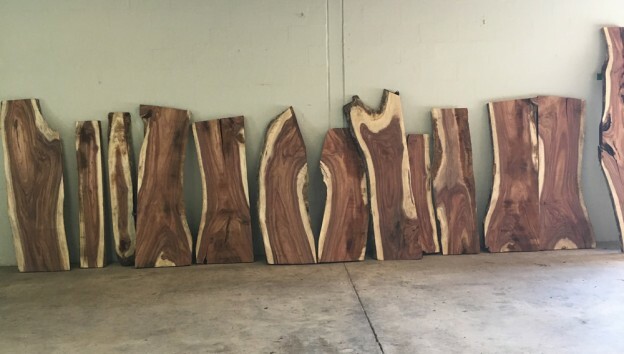 If you’re interested in exploring all the slab options available, visit our new website, WoodSlabs.com, or give us a call at 941-388-9299 and ask for Jason Peters. Start making your project unique with a one-of-a-kind wood slab. This entry was posted in Exotic Hardwood, News and tagged brazilian cherry slabs, chinaberry slabs, eucalyptus slabs, indian rosewood slabs, ipe slabs, leadwood slabs, live edge slabs, live oak slabs, monkeypod slabs, sycamore slabs, wood slabs on March 3, 2016 by Mr. Ipe Hardwood. I’ll pass on your email to our slabs sales rep and they’ll contact you accordingly!